In 1991, sub-contracted work for the Tyrell and Benetton Formula 1 teams laid the foundations for Cawkwell Engineering’s success. Having quickly established an excellent reputation within the Autosport industry, in 1992 Cawkwell Engineering began manufacturing for several other F1 teams. From this time motor sport has remained a core component of the company’s customer base, resulting work currently undertaken for seven of the world’s top F1 teams. Continuous investment in the best available equipment and systems has ensured Cawkwell Engineering’s ability to meet the ever increasing demands for its machining capabilities. Whilst the challenging lead times demanded by their F1 customers has lead to investments in advanced software packages that enable electronic data to be transferred direct to the company’s computer systems. Accredited to BS EN ISO 9001:2008, Cawkwell’s own in-house testing and inspection laboratory ensures that all of the work that the company produces is of the highest possible quality. Dimensional inspection is carried-out by a range of premium quality equipment, including advanced Coordinate Measuring Machines and Optical Measuring devices. In addition, the company administers a well equipped material testing unit. 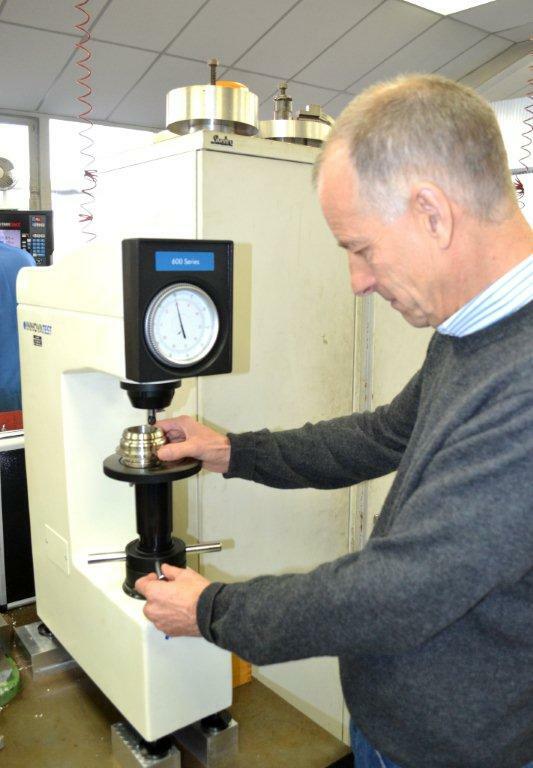 To further enhance its material testing capabilities, Cawkwell recently invested in a W-600A Rockwell Hardness Tester from Bowers Metrology. Company MD, Ian Underhill explained “We constantly strive to improve the high standards of service provided to our customers. We believe that a high quality product, manufactured on time for a reasonable price, is the correct basis for a lasting commercial relationship. Given the nature of our customers and the consequences of the failure in the field of any of our manufactured components, our commitment to, and our investment in ‘total quality’ is second to none. “In addition to making regular investments in the best available Machine Tools, we also regularly update our inspection and material testing equipment. Although our previous device was still giving us adequate service, to further improve our in-house hardness testing function, we recently looked at the available Rockwell Bench Hardness Testers. Having explored the various options we chose an advanced W-600A tester from Bowers Metrology. “Given the highly-skilled nature of our employees, our aim was to locate the new tester centrally within our manufacturing facility to enable ready access by all of our machine operators and quality personnel. The high usage, shop floor location of the machine and the diversity of the materials under test dictated that the new unit should be extremely robust, have the ability to deliver rapid, accurate results and be very flexible. With an accuracy specification conforming to EN-ISO 6508 and ASTM E-18, Bowers’ 600A Rockwell tester offers high accuracy, reliability and durability. Designed for use within the laboratory or on the shop floor, the tester’s rugged construction and large capacity enable it to stand up to the harshest of environments and to handle large test specimens. The 600A gives direct reading of Rockwell scales HRC, B, A, F or Superficial: HRT, HRN. Easy load force selection is accessed by a dial control, whilst variable damping is provided with an adjustable oil brake. The popular W-600A Rockwell Hardness Tester is part of Bowers’ comprehensive range of material testing devices and is available for on-site demonstration. For more information on the W-600A Rockwell Hardness Tester, click here.